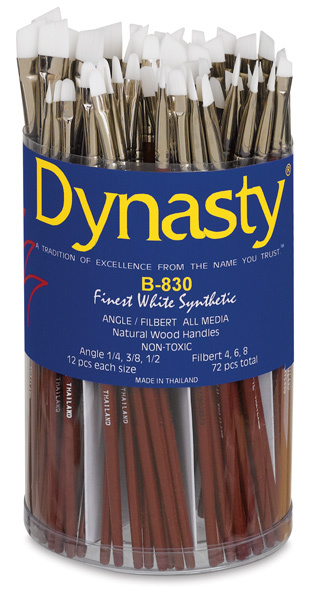 These brushes by Dynasty feature White Taklon bristles with seamless, nickel-plated ferrules on short red lacquered handles. Synthetic White Taklon is more durable and less prone to breakage than natural hair, making it an excellent choice for beginning artists. This canister contains 12 each of 1/4", 3/8", and 1/2" Angle brushes and 12 each of Size 4, 6, and 8 Filberts for a total of 72 brushes.